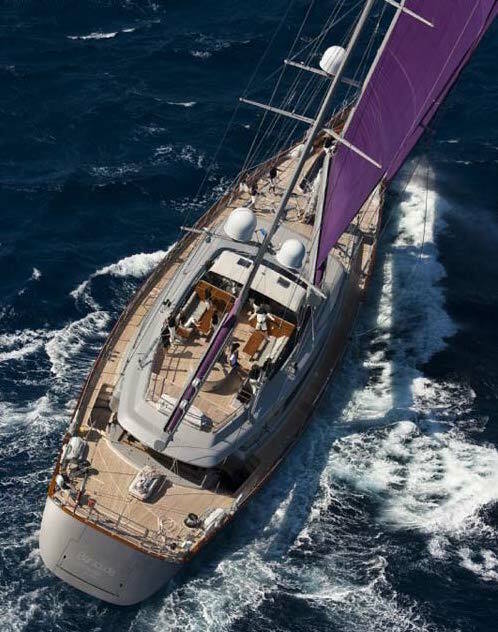 BARACUDA VALLETTA (ex. 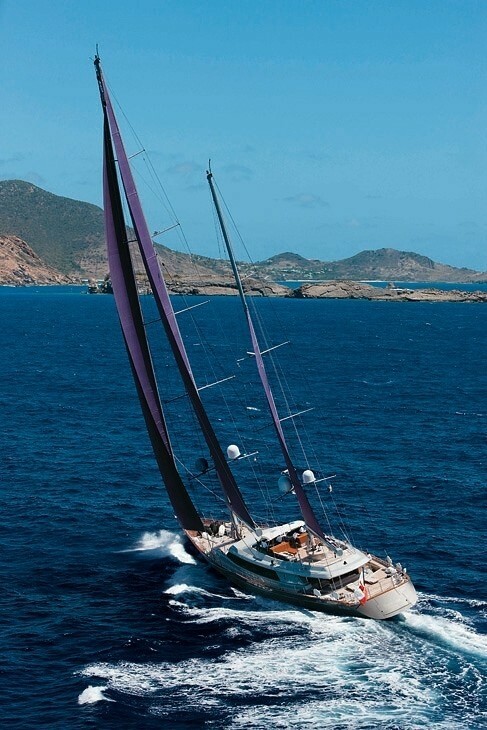 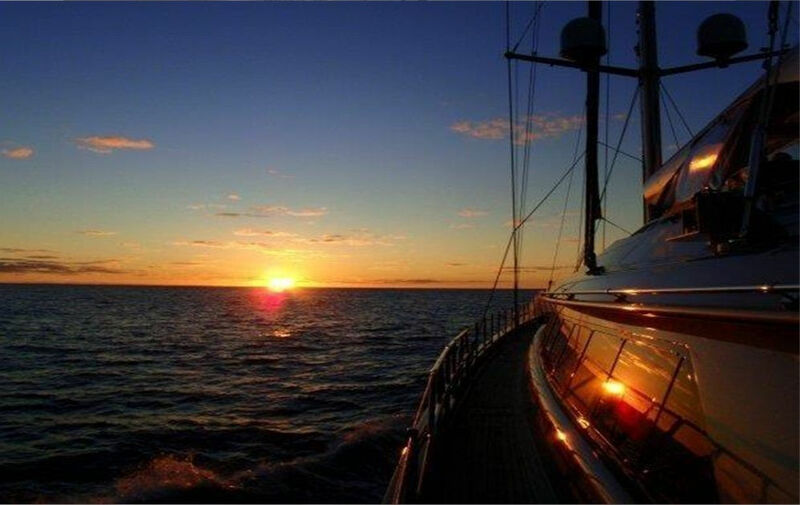 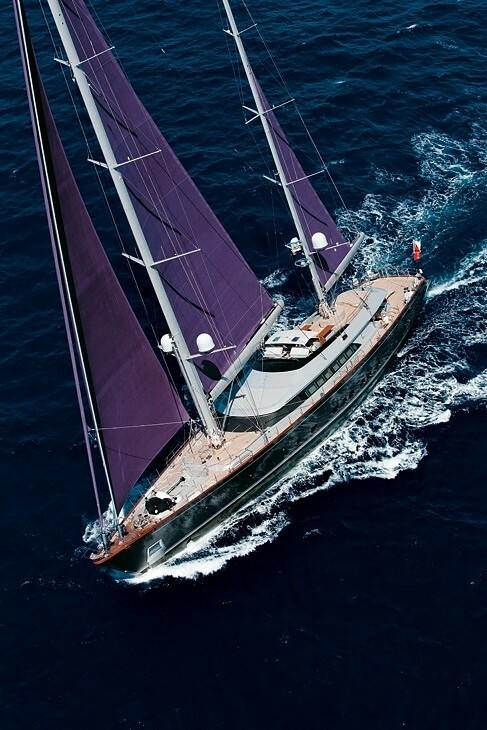 BARRACUDA) is a 50,00m (164’) Perini Navi sailing yacht launched in 2008. 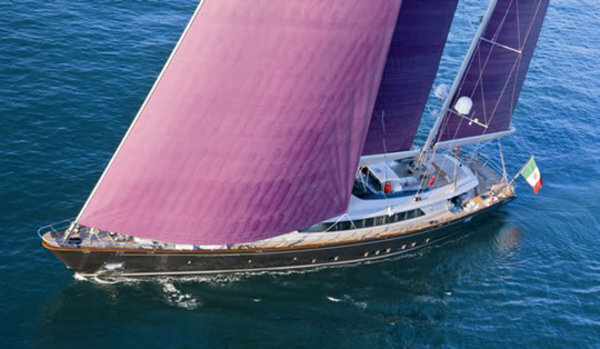 Sailing yacht BARACUDA VALLETTA is an aluminium ketch which was the 46th vessel, perfect for charters in the Eastern Mediterranean. 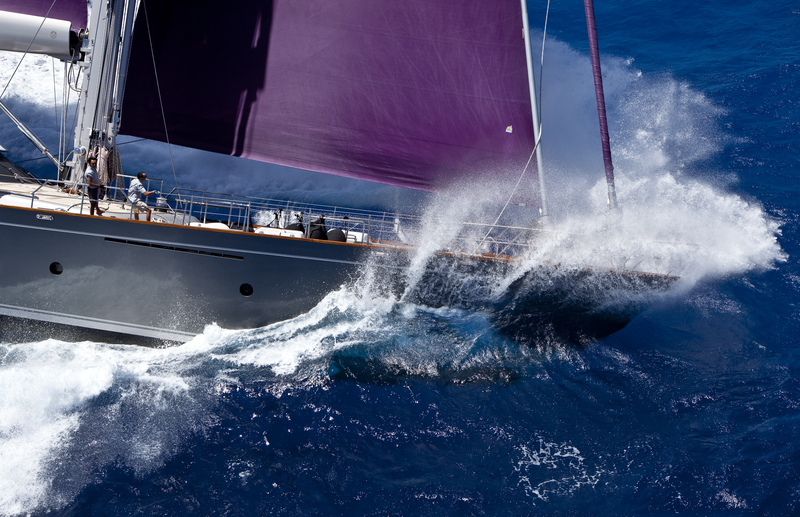 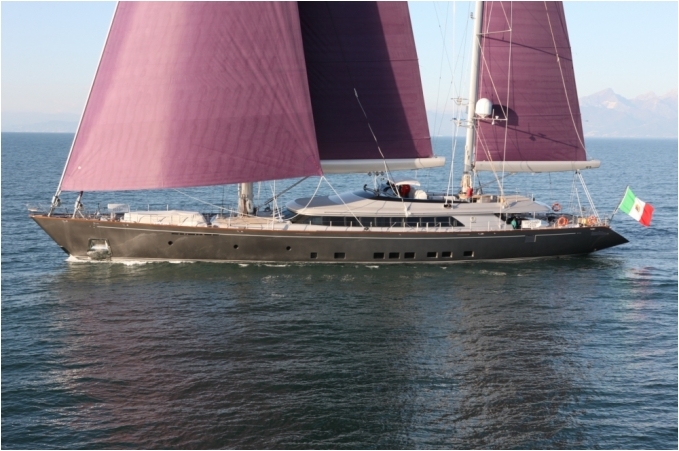 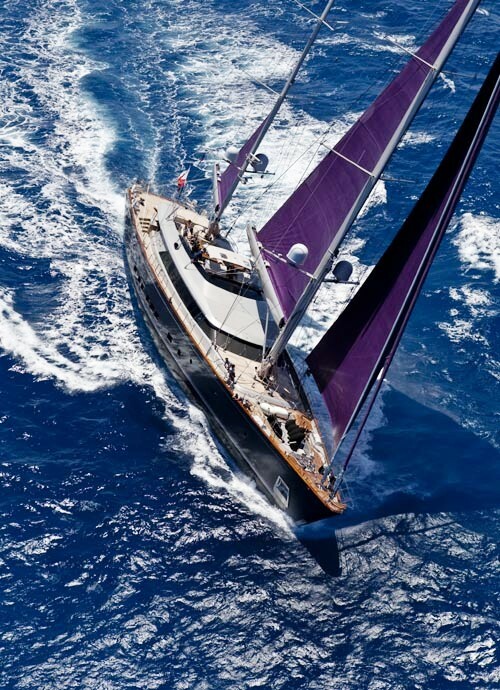 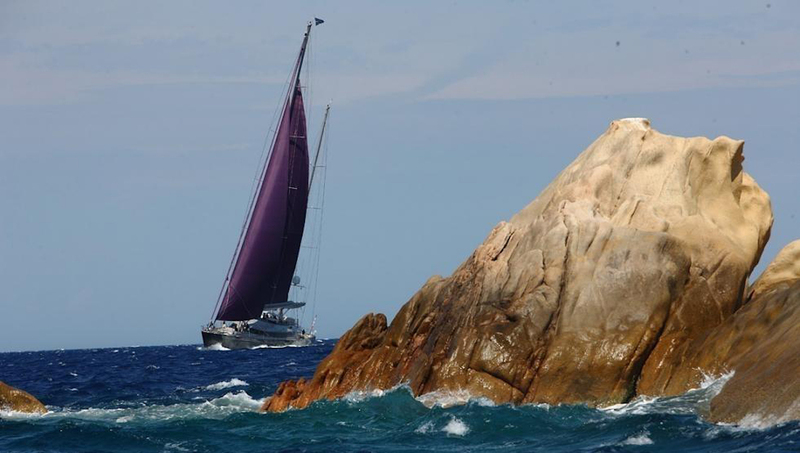 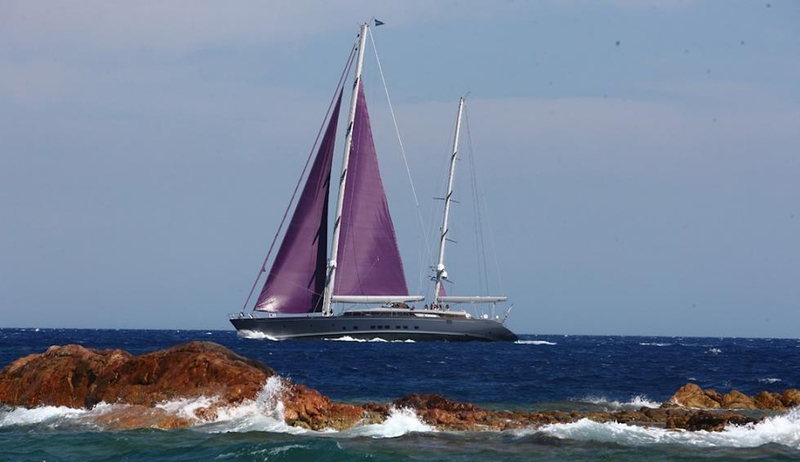 She was designed by Perini's in-house naval architects teamed with New Zealander Ron Holland. 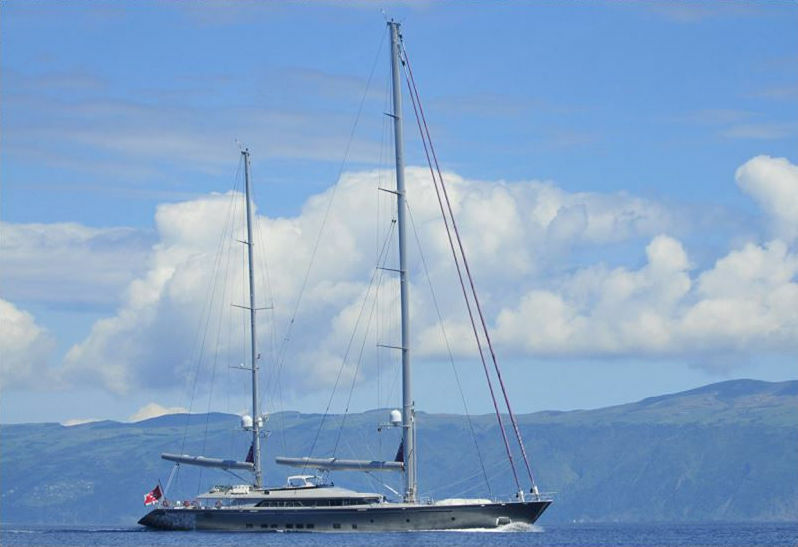 The luxury sailing yacht BARACUDA VALLETTA features recognisable Perini Navi trademarks including her deckhouse lines, with curved windows and long flying bridge. 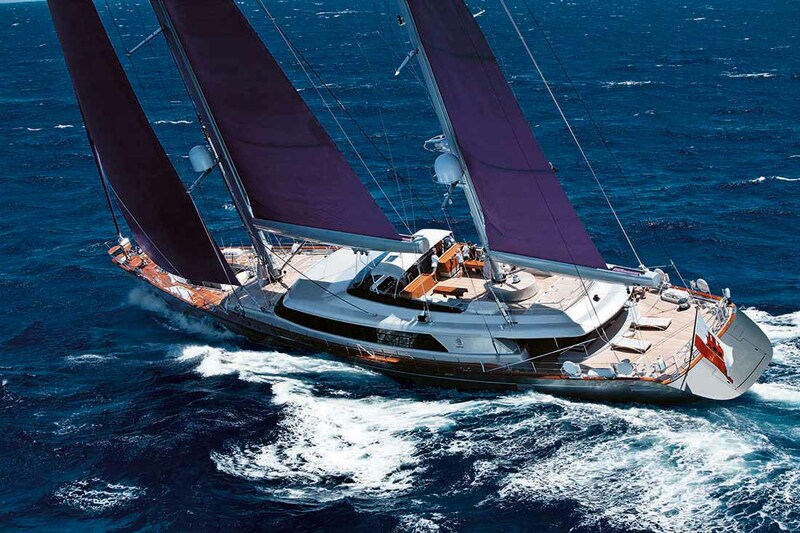 Her aluminium hull, tapering and deep semi-compensated rudder, extended waterline, and lead ballasted swinging keel, makes this superyacht the latest evolution of the successful 50-meter series. 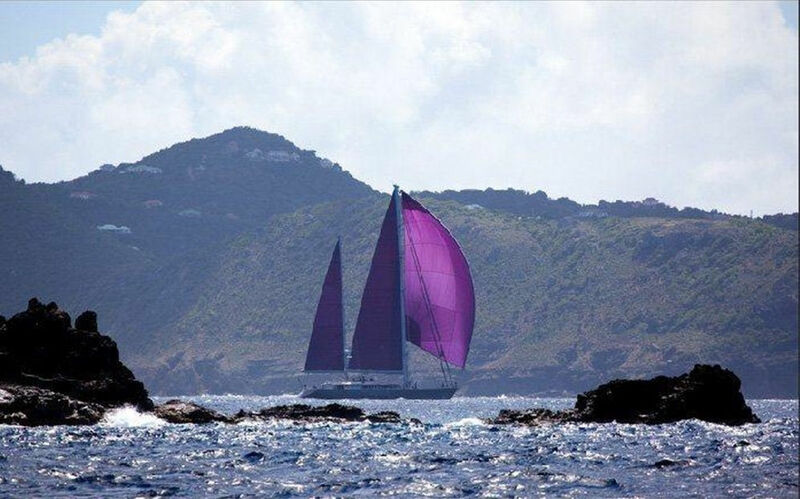 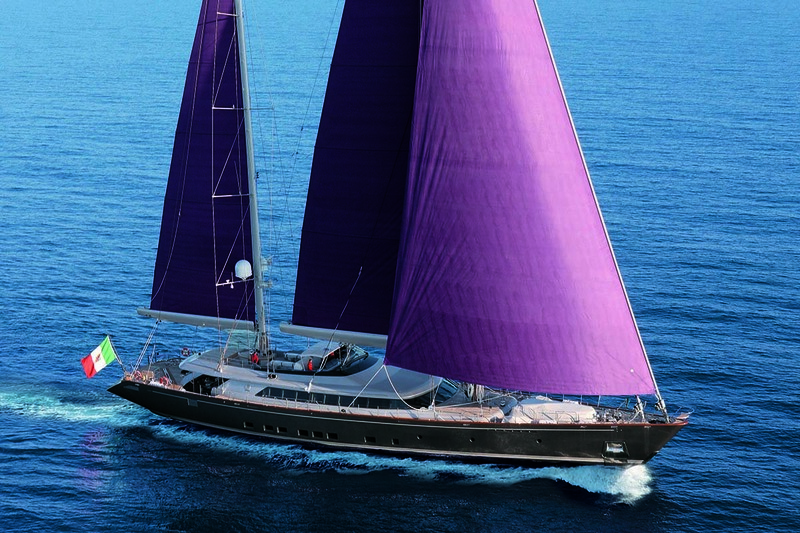 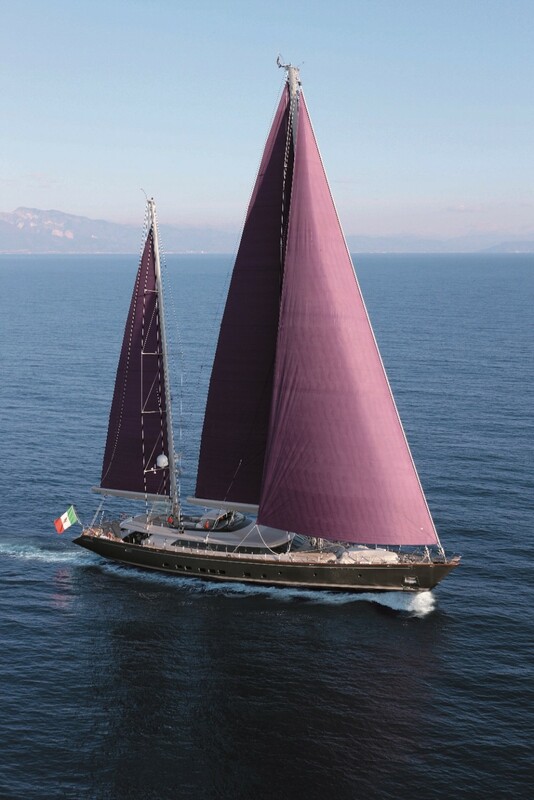 This ketch also makes a strong visual impact primarily by the colour of the hull which is metallic grey with shades of gold and the sails which come in flaming purple. This contemporary appeal is also echoed in the portholes, which are an unusual rectangular shape. 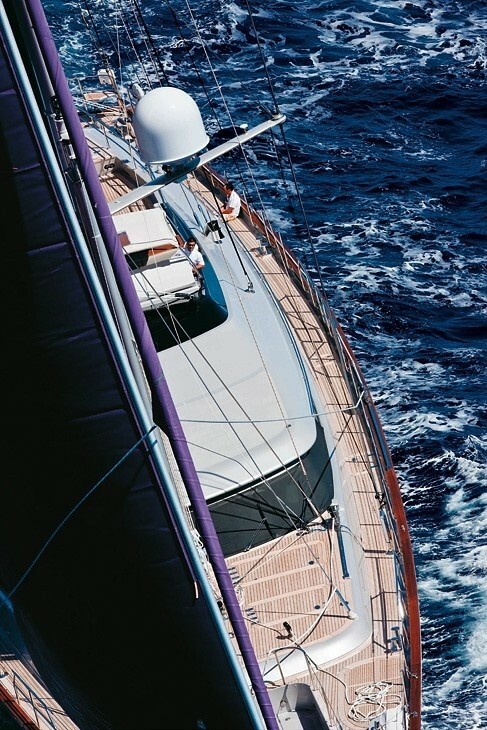 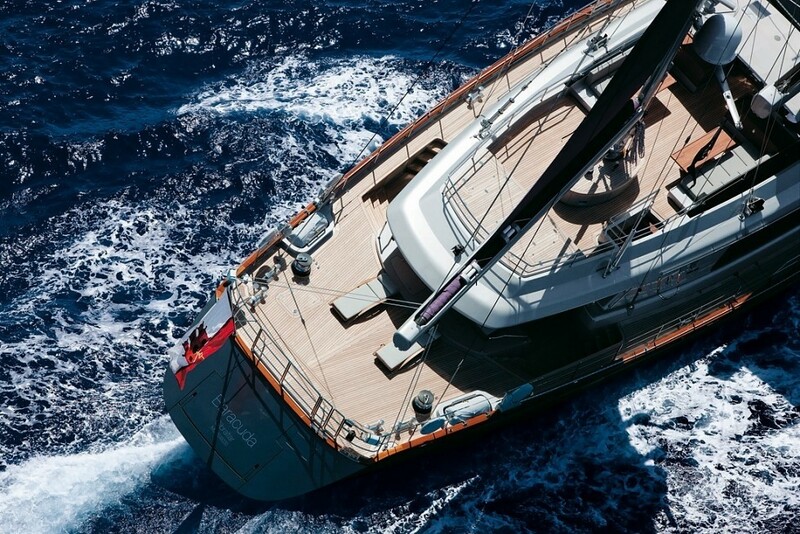 The Superyacht BARACUDA VALLETTA features many innovations including a canting keel that changes from a 4m draft with her keel up to a 9.7 m draft with her keel down. 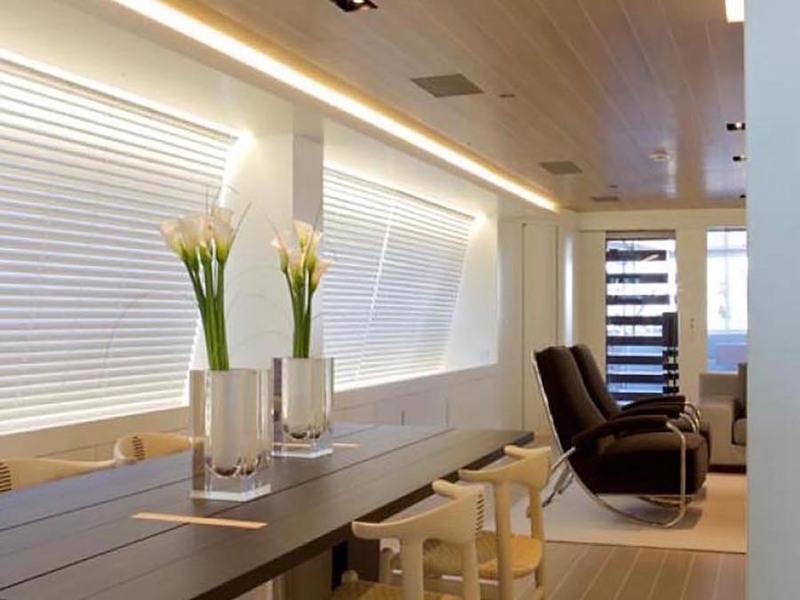 The transom door can be cleverly opened almost entirely to transform into a large platform for both tender launching and swim access. 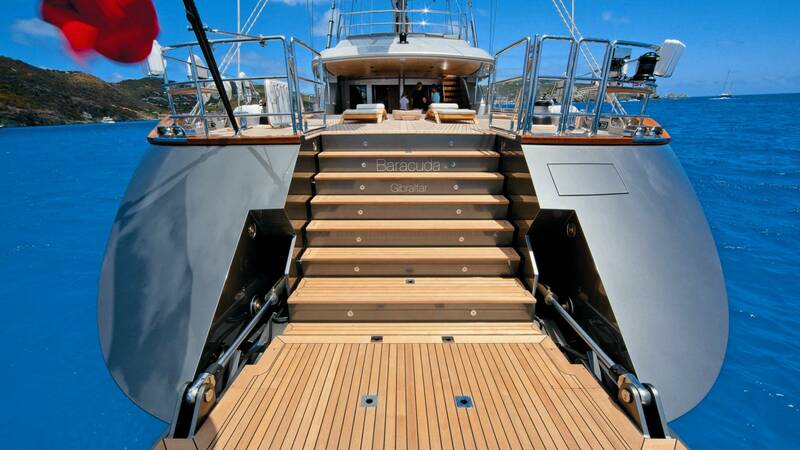 The hydraulically operated swimming platform can be submerged 8 inches below the water's surface accessed by guests via a staircase on the aft deck. 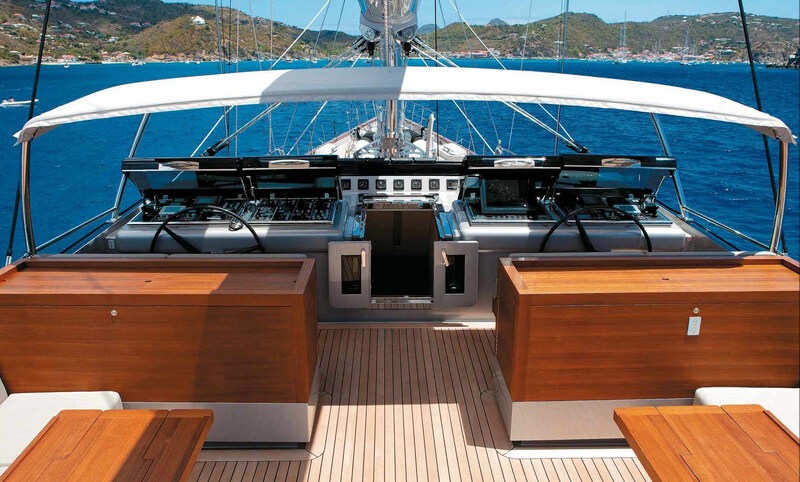 Sail boat BARACUDA VALLETTA’s main deck is one level and is 22 meters in length from the aft sunken cockpit throughout the inner wheelhouse. 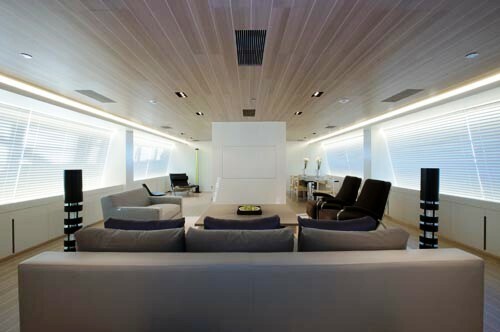 The extended windows provide natural lighting and panoramic view. 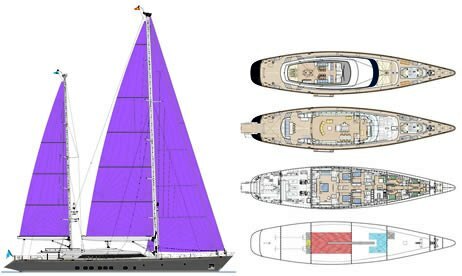 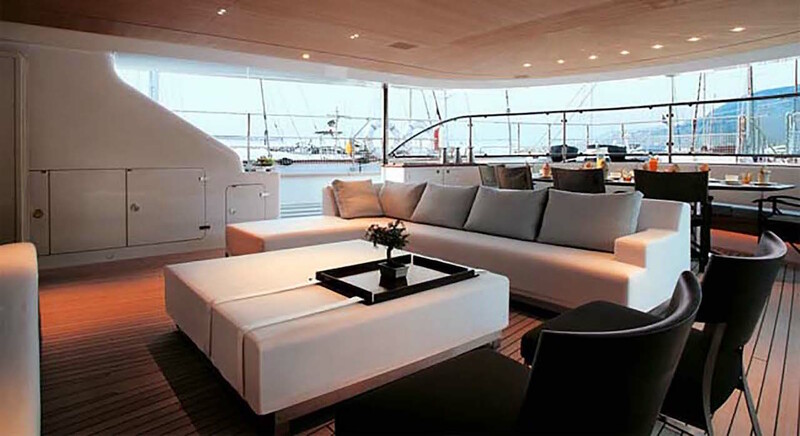 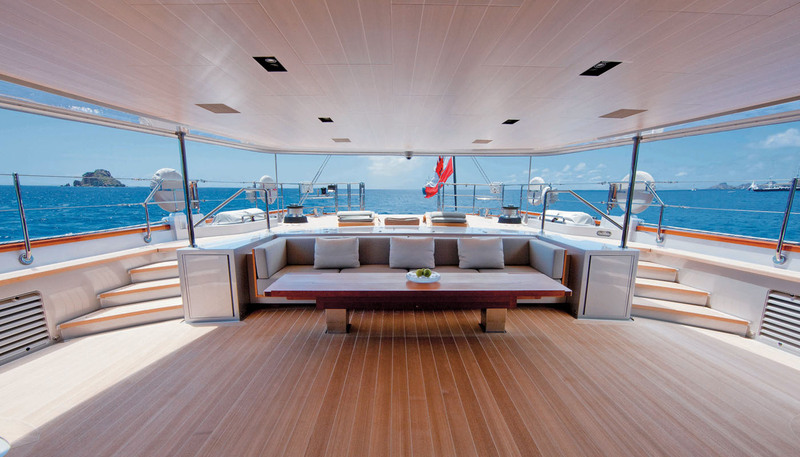 The main deck is conceived as open living space, with no partitions, with the aim to keep a much clearer, unencumbered visual field than is conventionally the case on sailing yachts of this type. 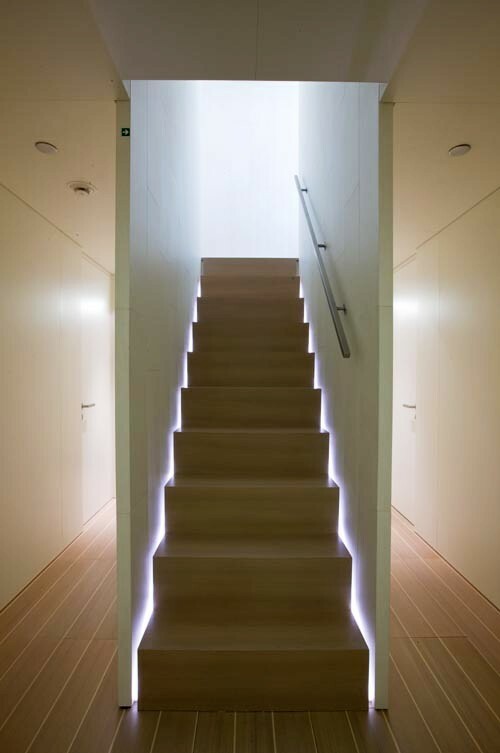 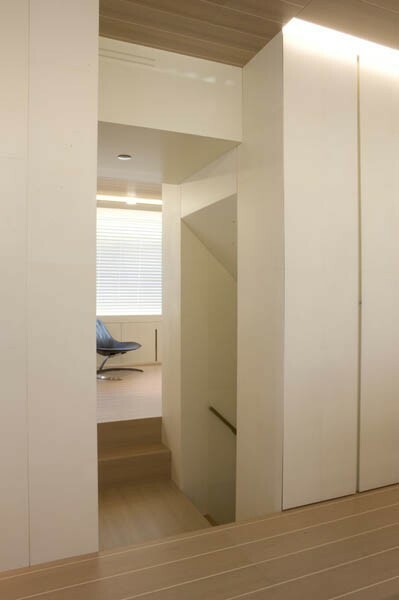 The partial central wall in the salon was chosen not only for the subtle beauty of its colour and texture but also for the way it serves to dematerialize the central stair volume. 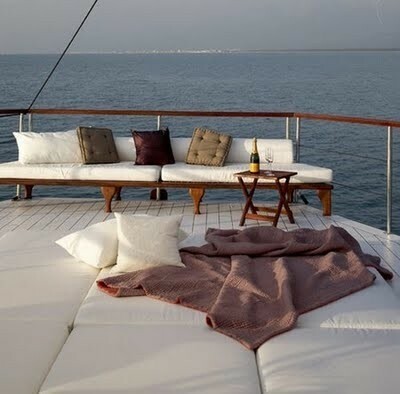 The master suite and 4 guests cabins are all located on the lower deck lower deck. 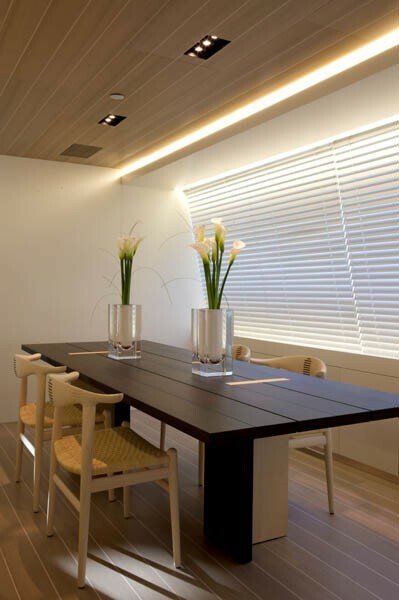 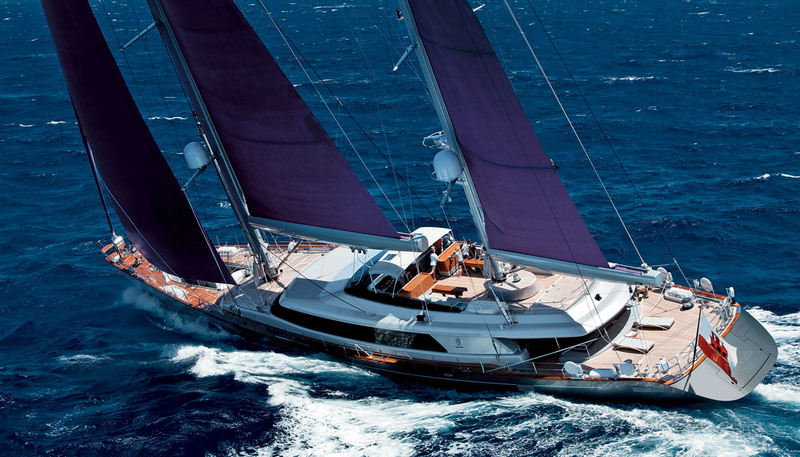 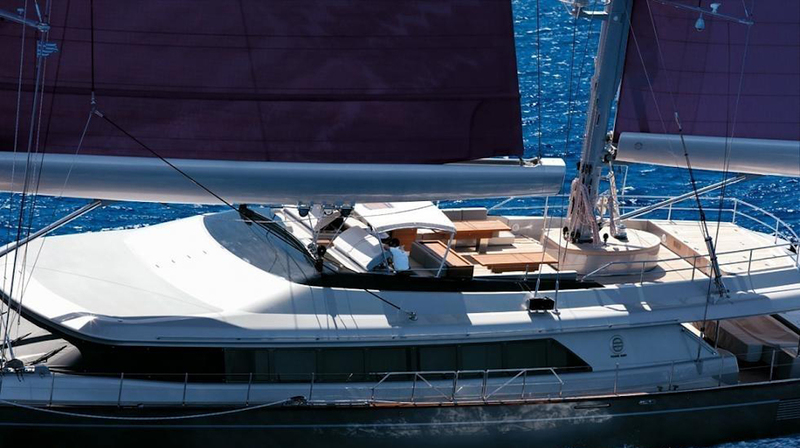 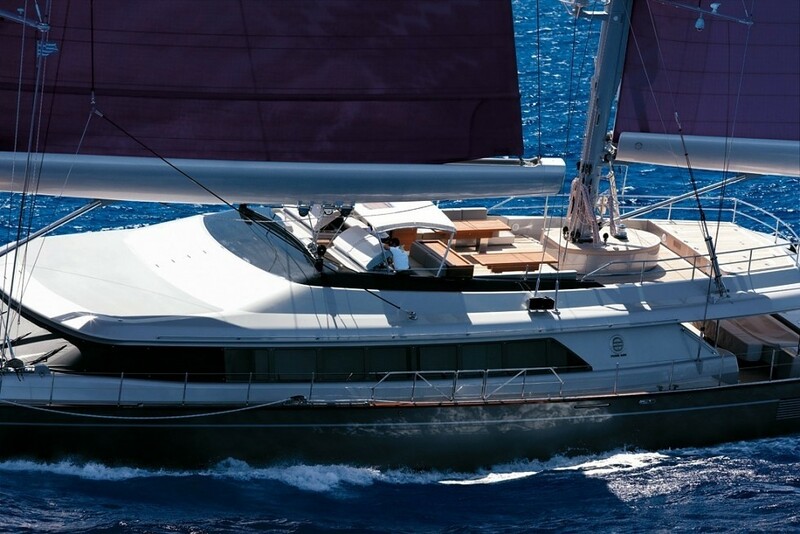 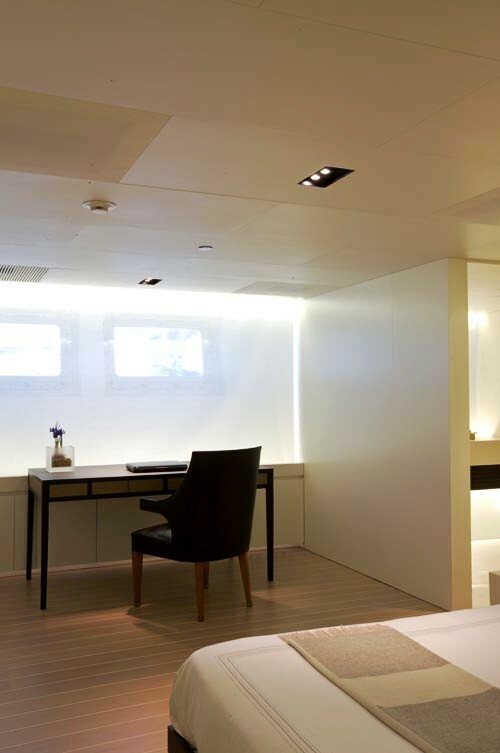 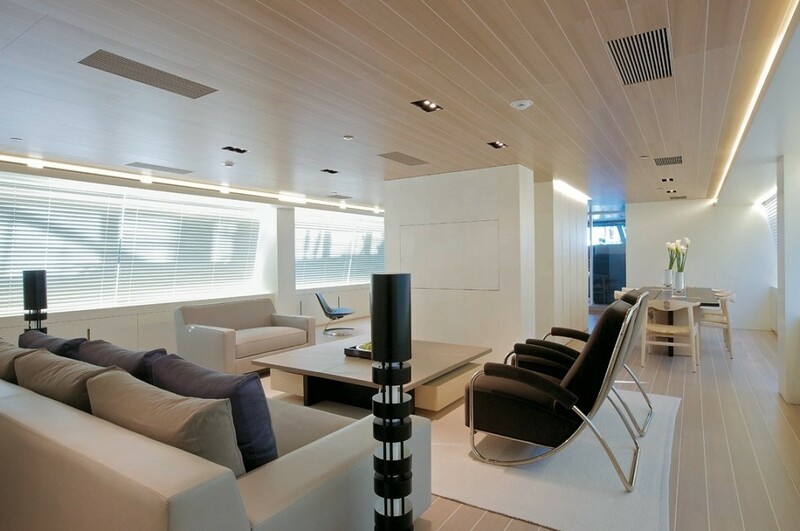 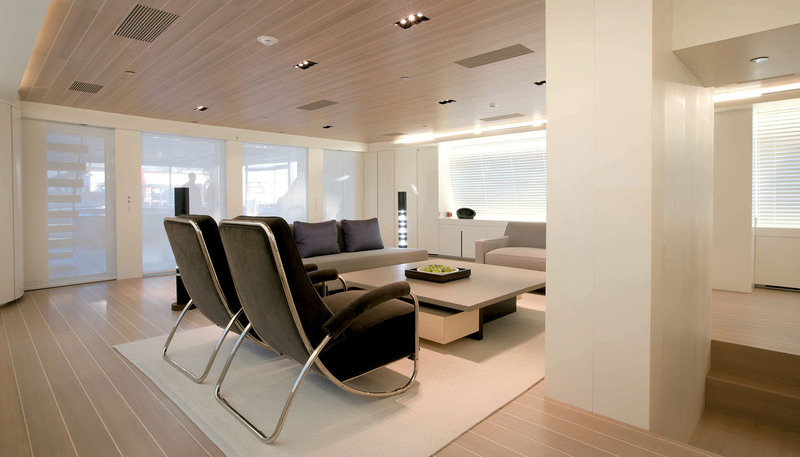 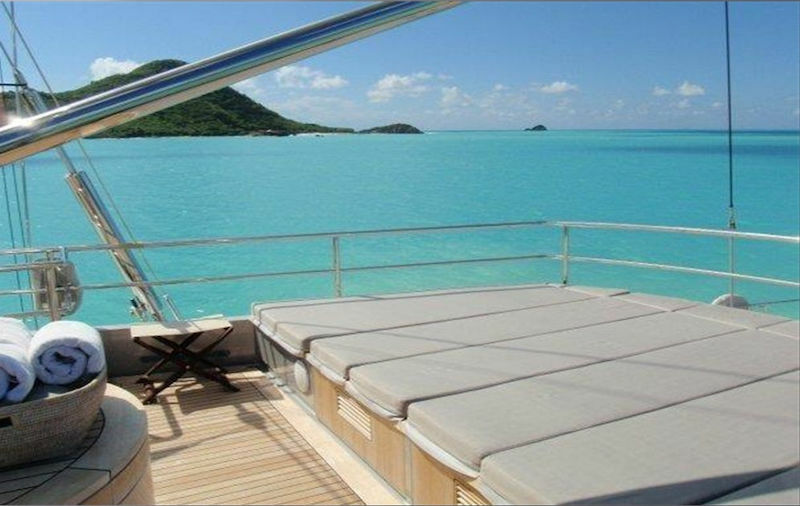 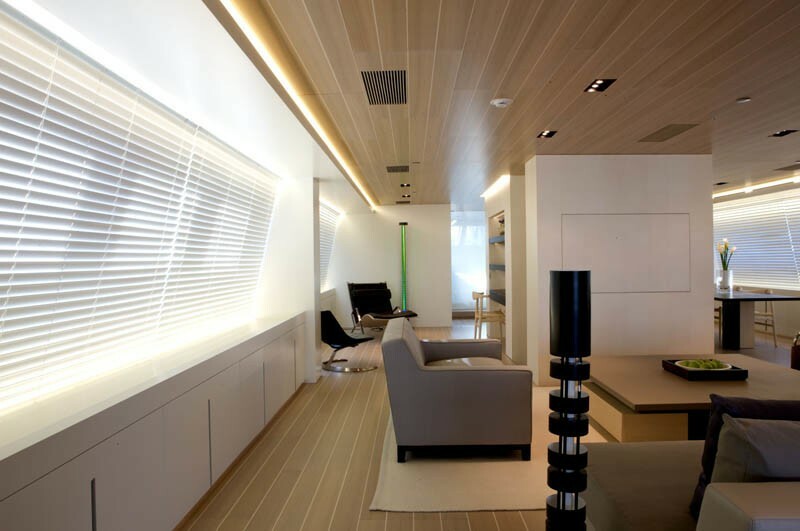 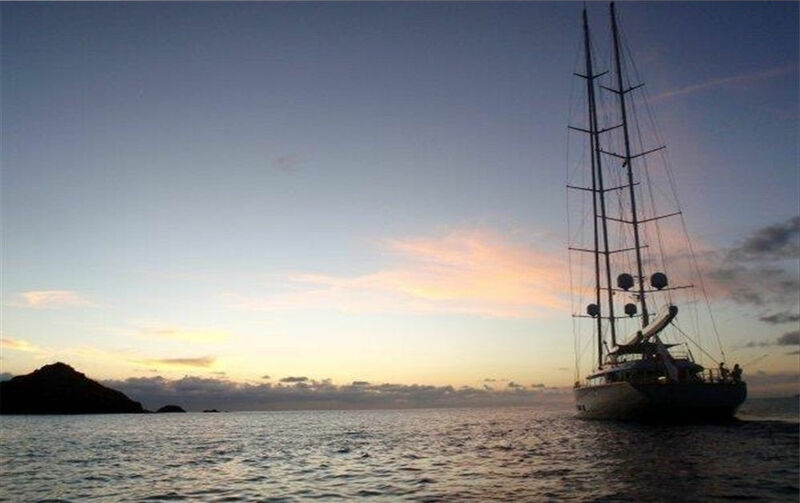 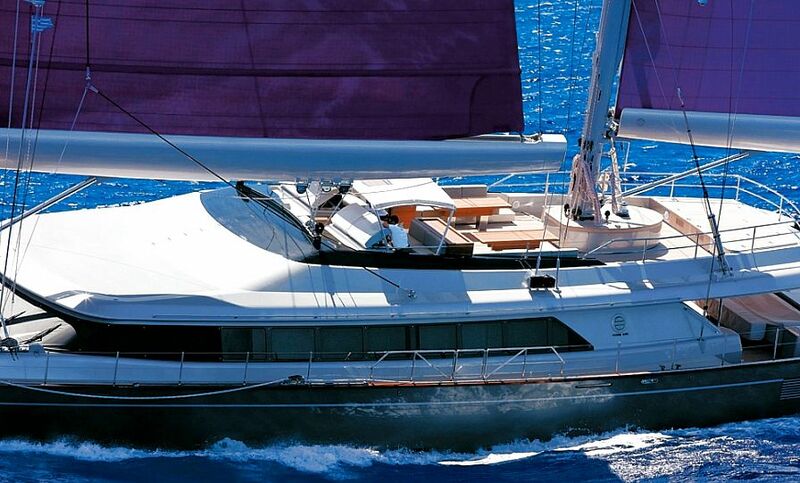 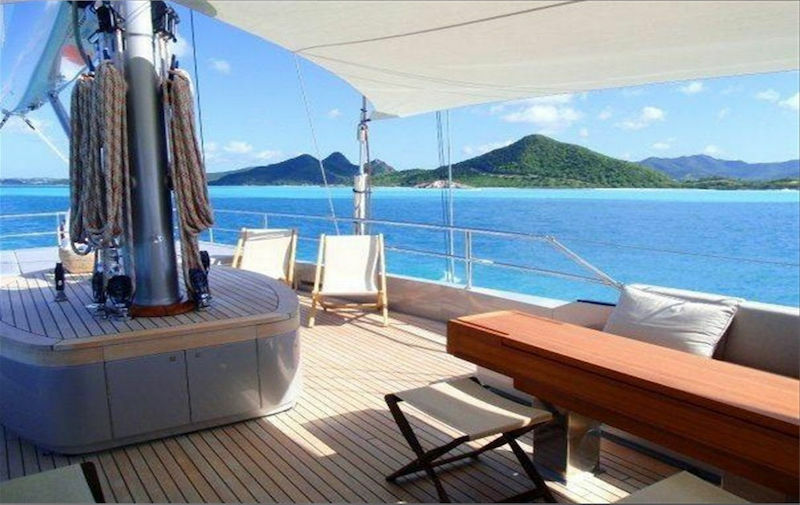 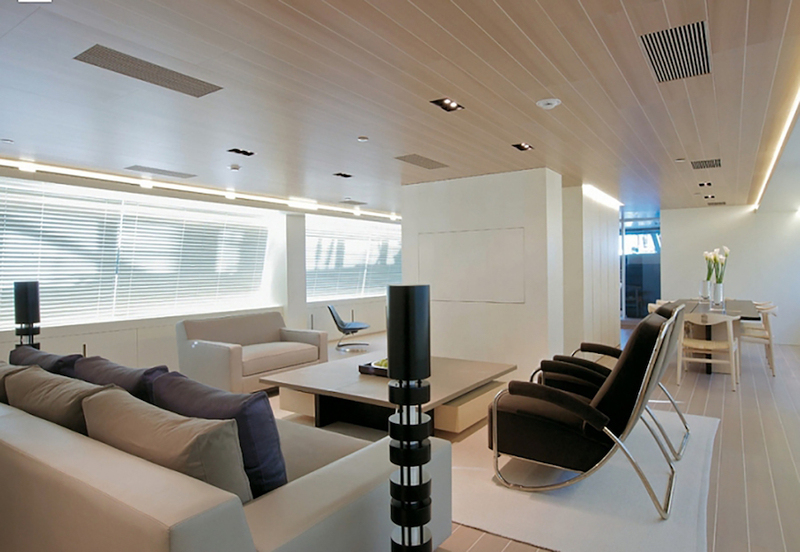 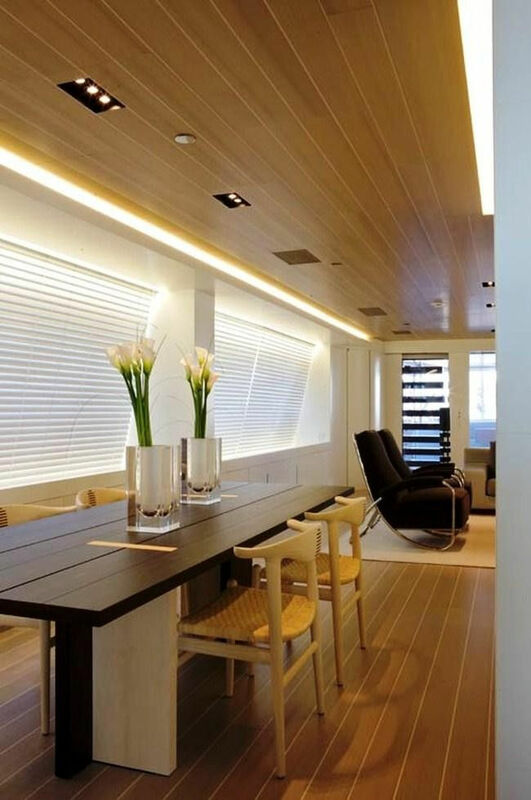 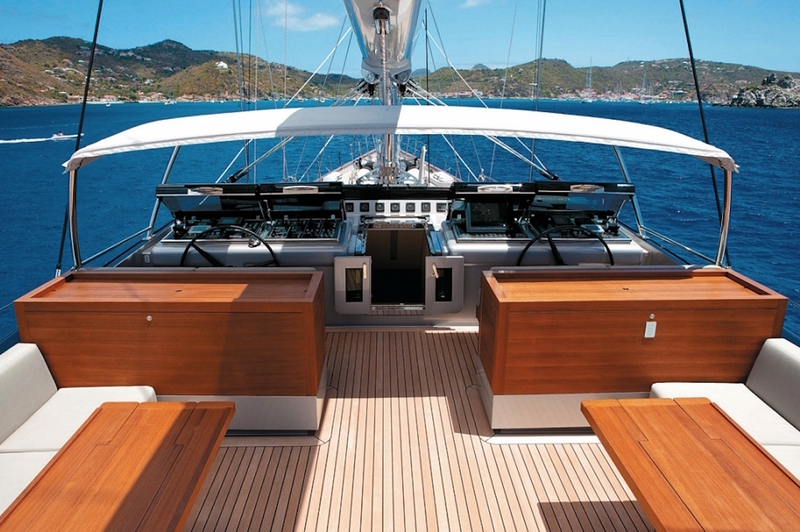 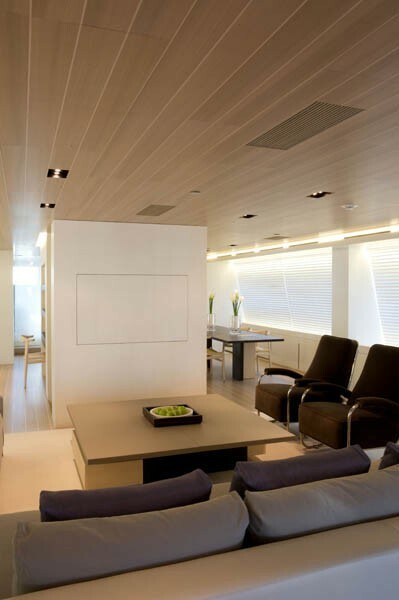 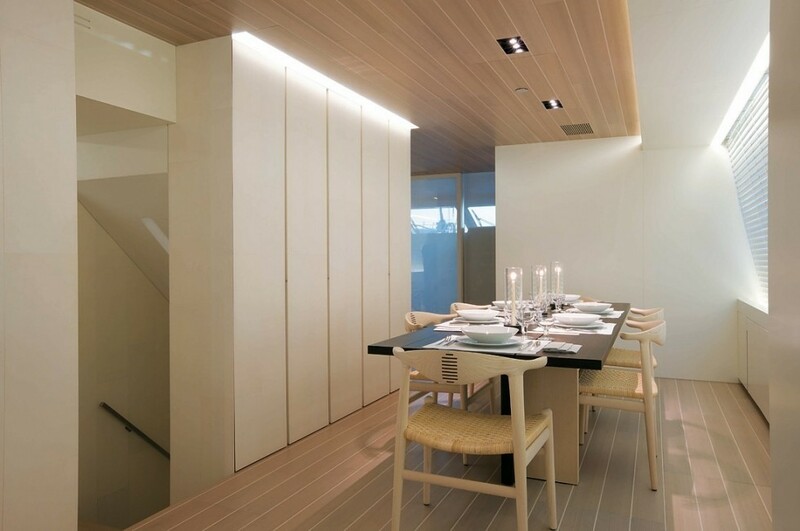 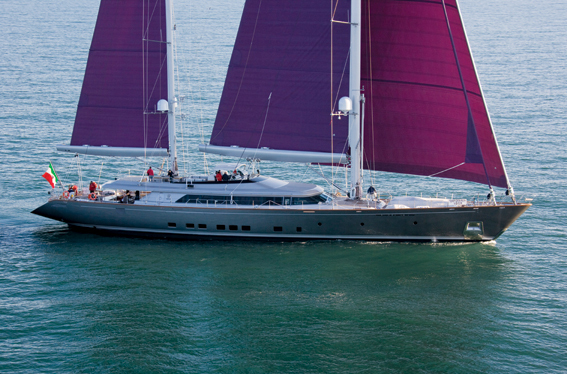 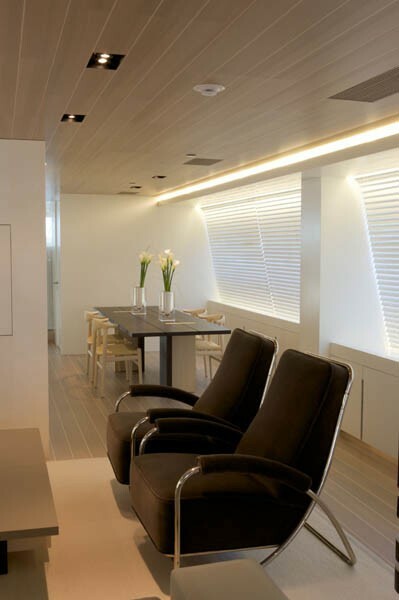 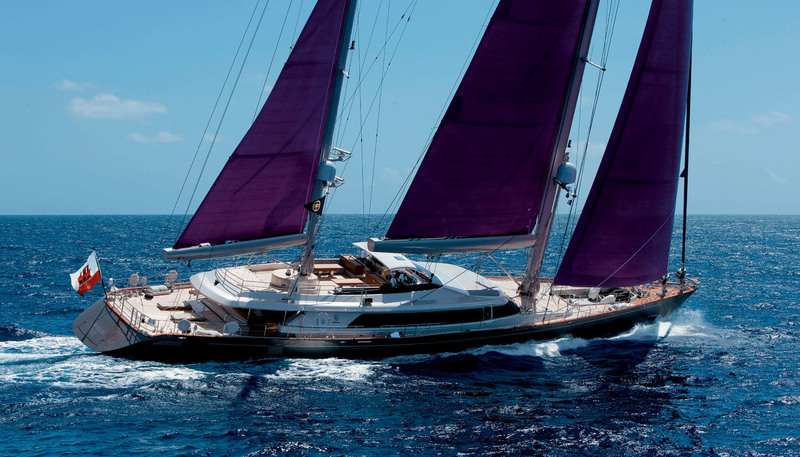 S/Y BARACUA features interior design by British architect John Pawson, the guru of the modern minimalism. 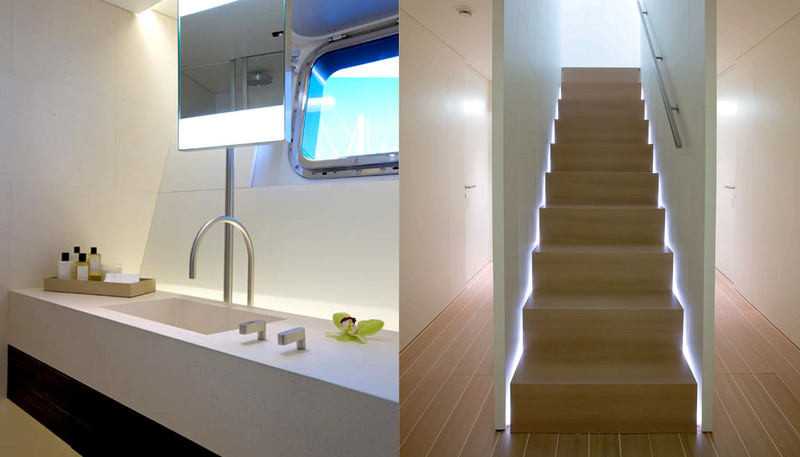 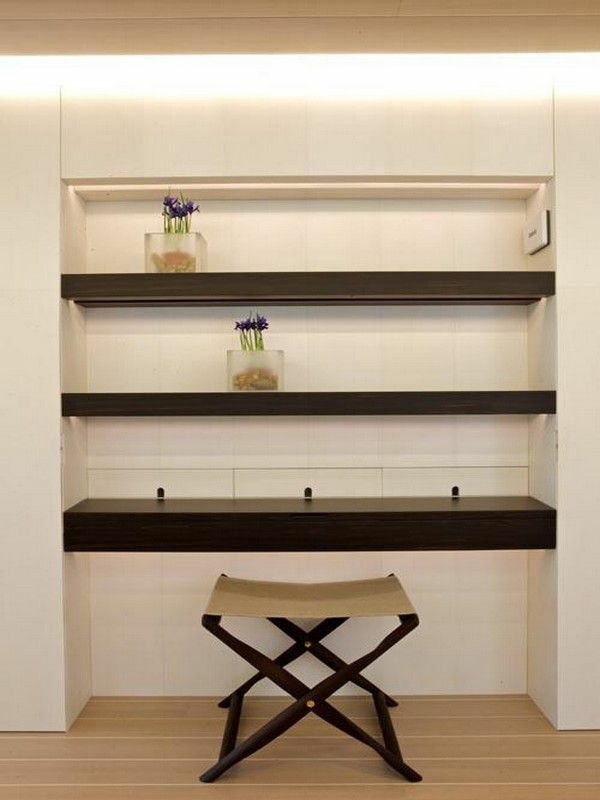 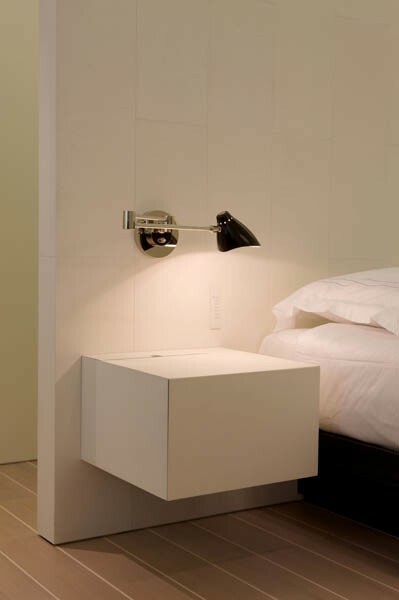 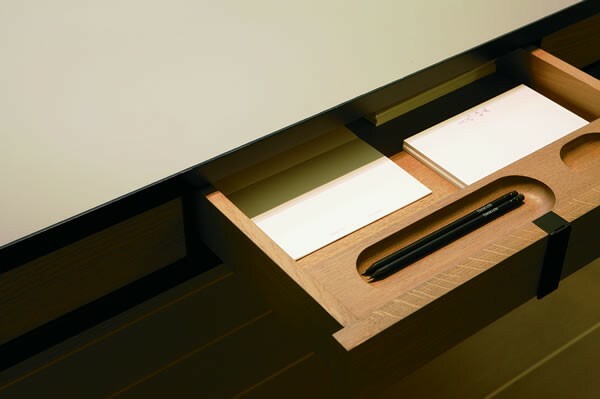 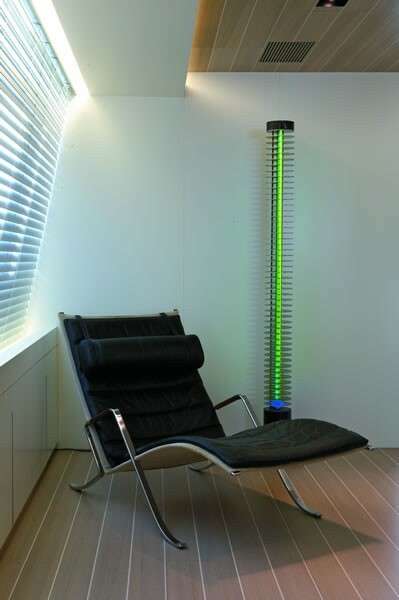 The style and project philosophy are extreme simplicity and clean lines with concepts of light, space and proportion. 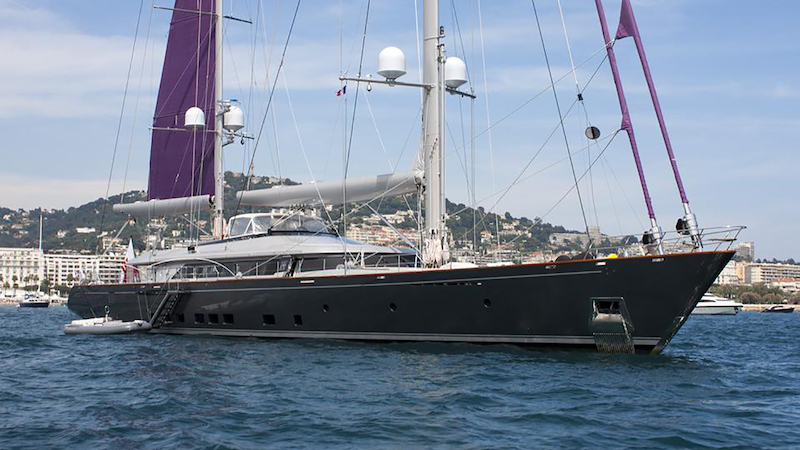 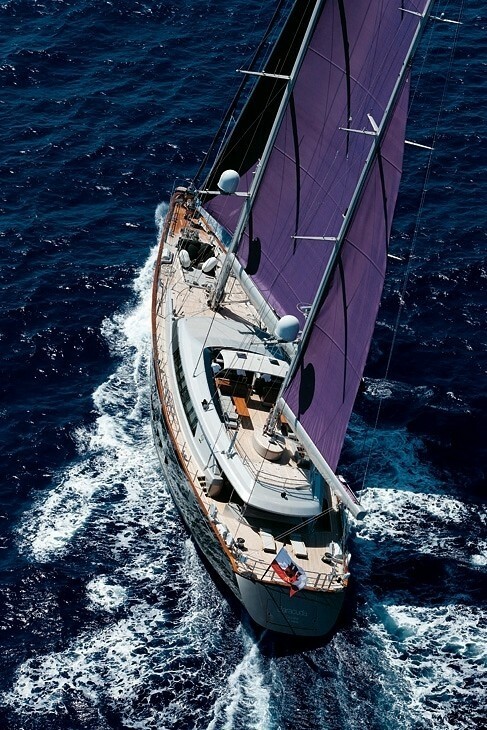 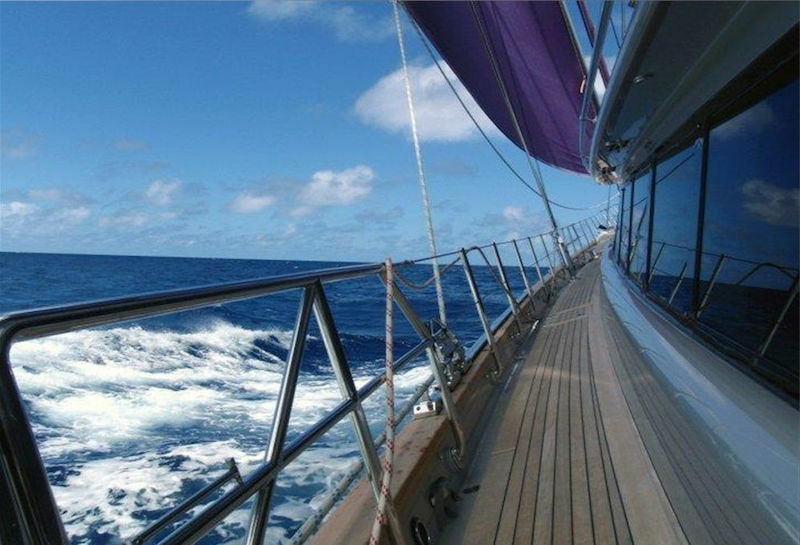 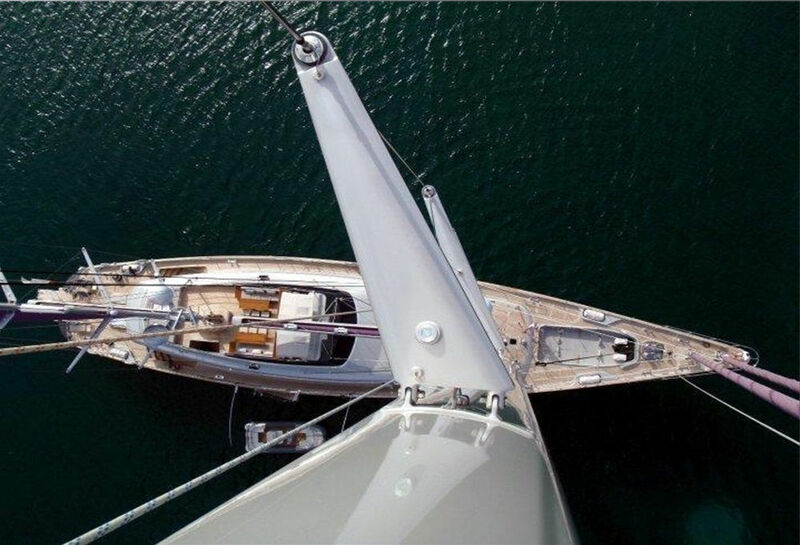 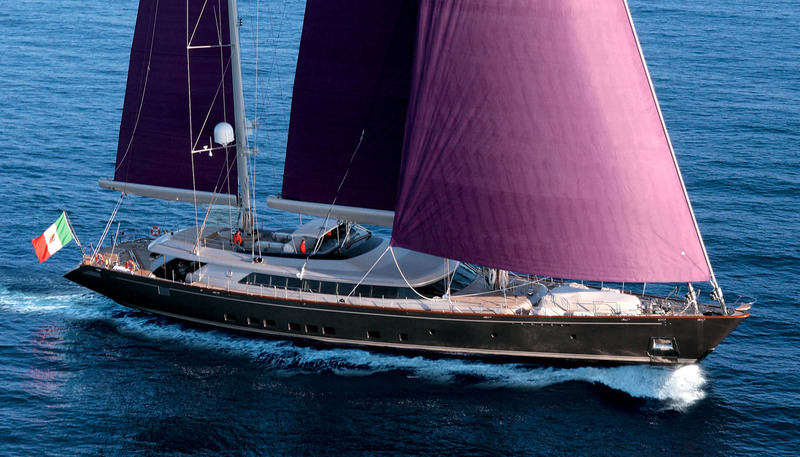 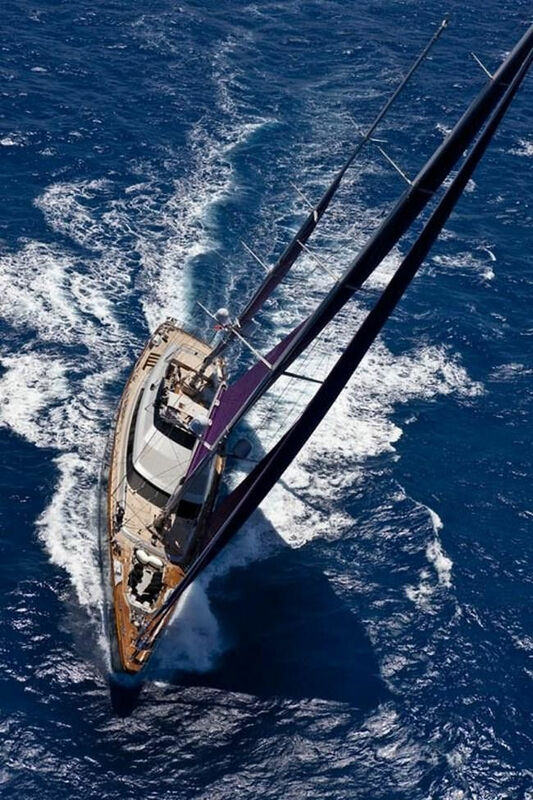 Luxury Perini Navi sailing yacht BARACUDA VALLETTA has a state-of-the-art sailing system with aluminium, ketch rigged masts that are 56.7 and 42.9 meters from the DWL. 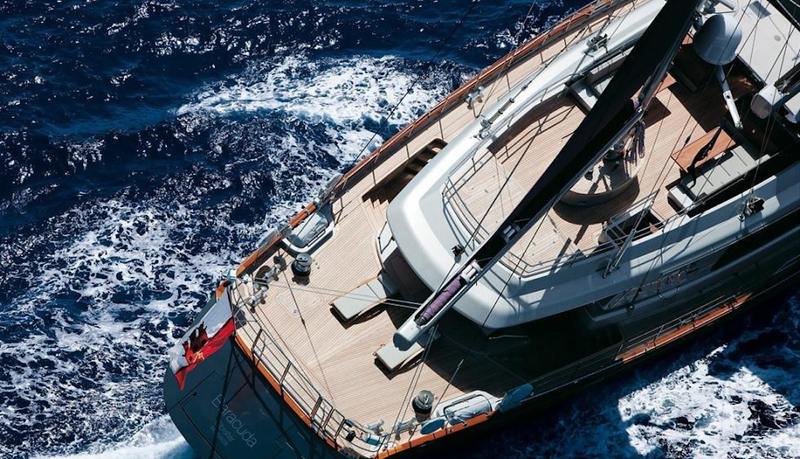 Perini also designed, engineered and manufactured the carbon fibre electric in-boom furling system and the captive reel winches that handle a sail plan of 1,418 square meters, which consists of the main and mizzen sails plus genoa and blade jib. 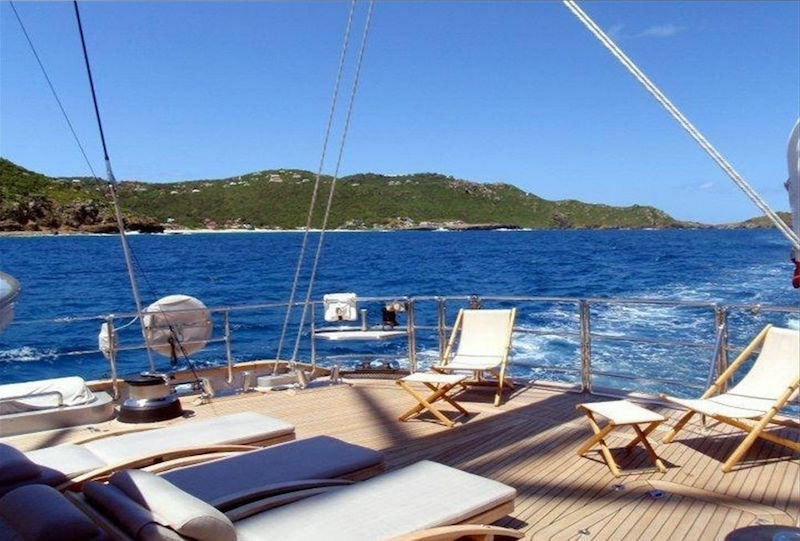 Luxury yacht BARACUDA VALLETTA has a professional crew of 8, who will make sure the highest standards of service onboard, while the guests will enjoy cruising throughout Greece and the Eastern Mediterranean. 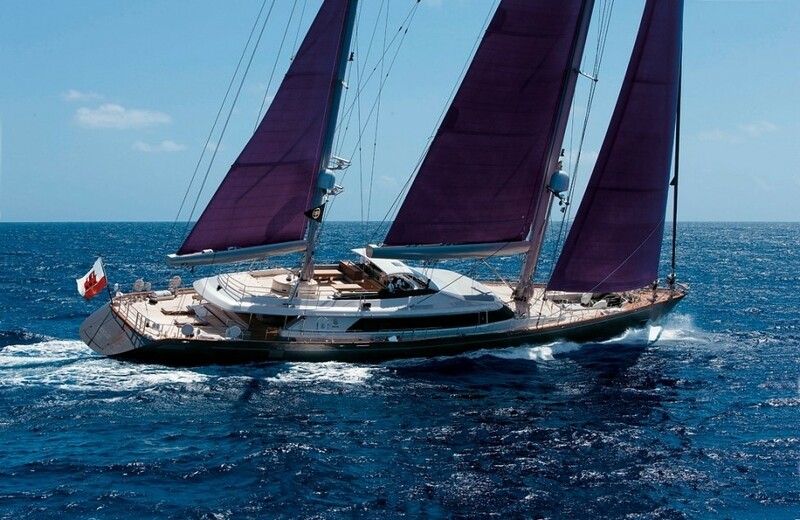 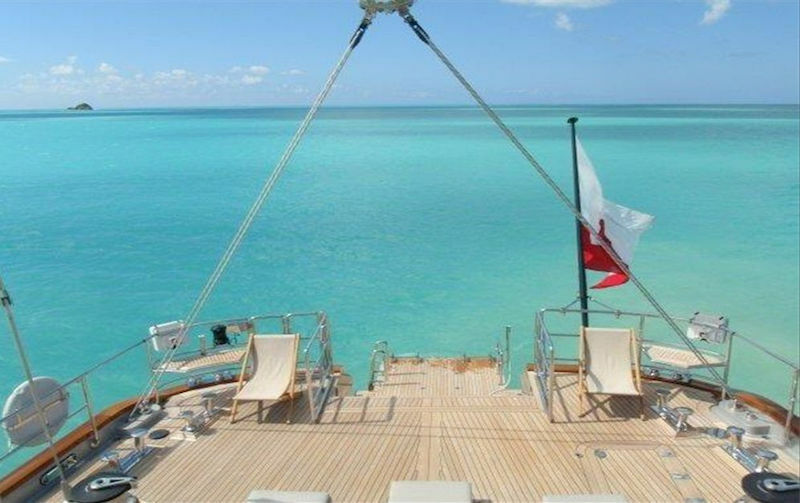 Luxury Superyacht BARACUDA VALLETTA (ex BARRACUDA) can accommodate up to 10 guests in 5 cabins on the lower deck. 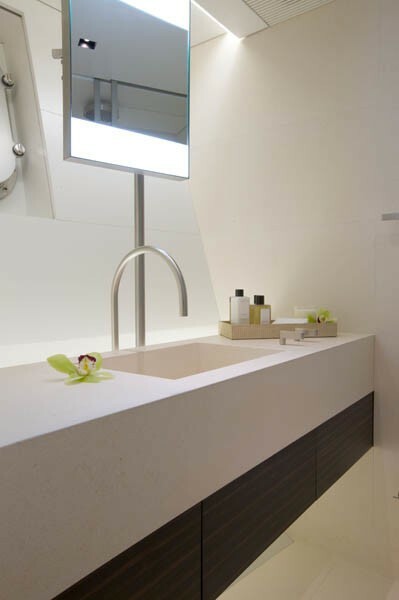 The full beam Owner’s suite features a central king-size bed and his and her bathrooms. 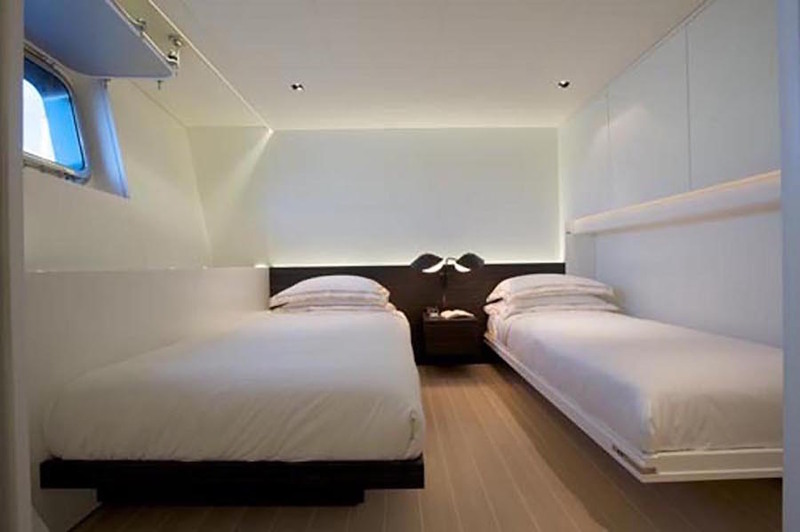 The guest cabins consist of two VIPs cabins fitted with queen-sized beds and two cabins with twin-beds and pullman berths. 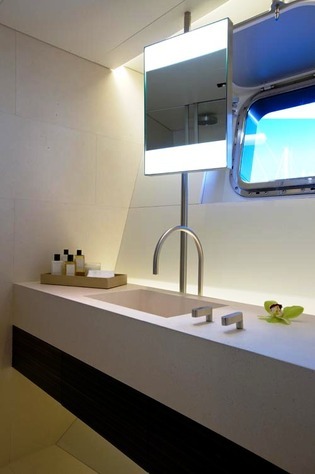 All guests cabins have en-suite bathrooms. 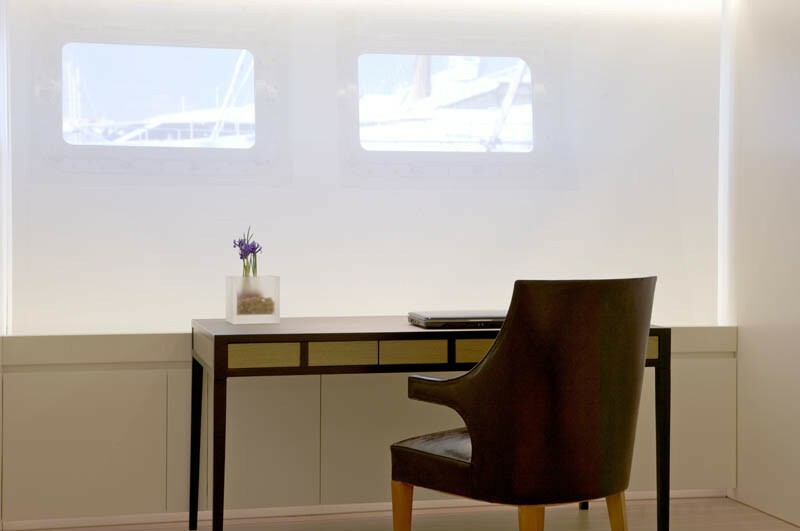 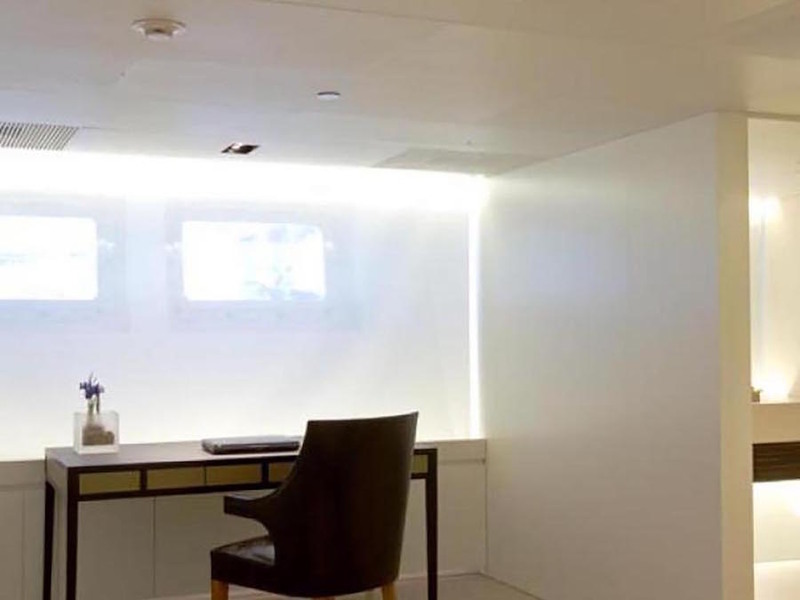 The crew area allows for 8 crew in 4 cabins, plus an additional captain’s cabin. 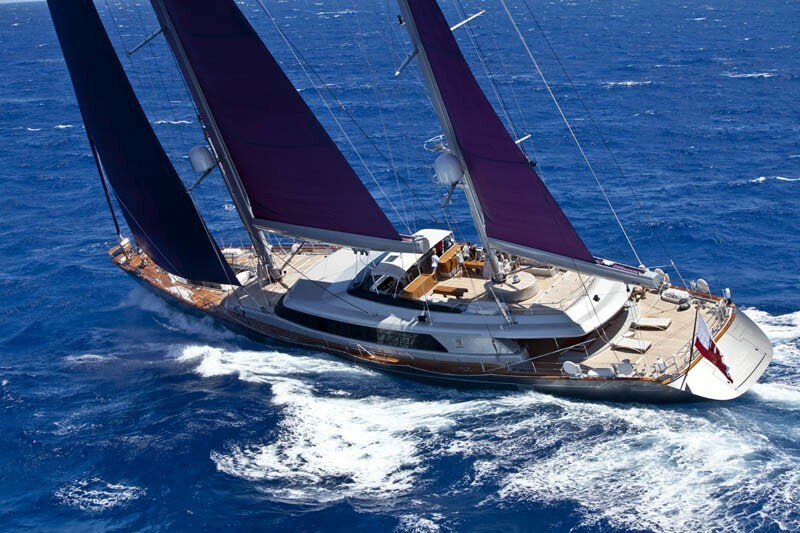 Luxury Perini Navi sailing yacht BARACUDA VALLETTA has a Wake board, water skis, mono ski, tubes, and a banana. 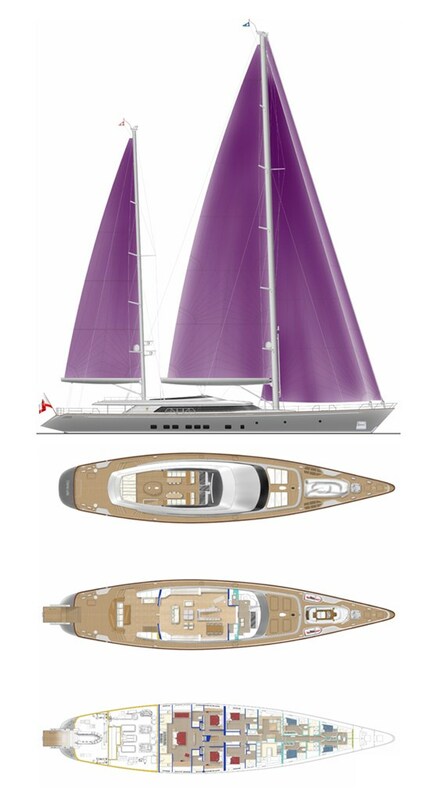 Communications include V/Sat, 3 viop lines, fleet broad band.